Ever since he arrived in Washington, Paul Ryan has made it clear that he prefers to get into the nuts and bolts of policy rather than getting a sound bite on cable news, and this morning he reaffirmed that worldview. 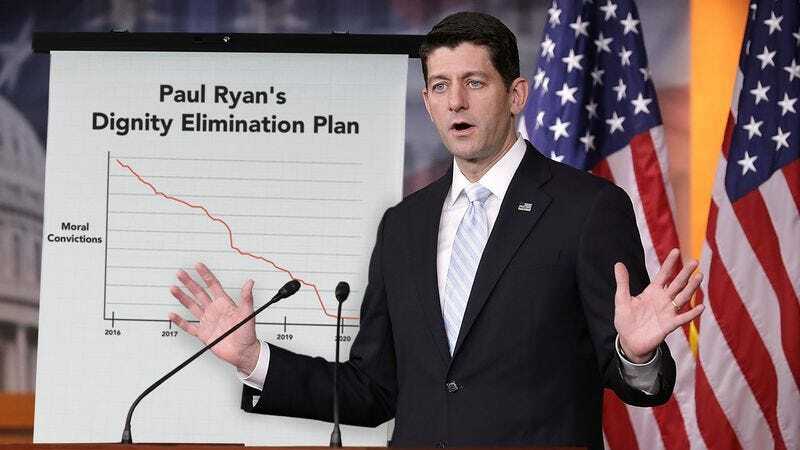 Clearing up a cloud of speculation over the future path of the GOP, Speaker of the House Paul Ryan released a proposal outlining his plan to utterly debase himself before Donald Trump. Paul Ryan went on to highlight how his meticulously planned-out initiative makes good on his campaign promise to betray everything he holds dear in support of Donald Trump. Whether you’re a Republican or a Democrat, you’ve got to give Ryan credit for laying out a plan this well-thought-out. It’s becoming increasingly clear that if anyone is going to turn Paul Ryan into Trump’s quivering little slave boy, Paul Ryan is the right guy to do it.